In this video we will discuss versioning a Web API Service using vendor specific media types. This is continuation to Part 38. Please watch Part 38 from Web API tutorial before proceeding. Notice in the media type, we have the version of the service we want. Custom media types have vnd prefix. vnd indicates that it is a vendor specific media type. So from our CustomControllerSelector class we want to read the version number from the custom media type we have specified. // // then in versionNumber variable will get a value of "1,1"
// Users can include multiple Accept headers in the request. So at this point, if we issue a request using our custom media type from fiddler, we get version 1 of student objects in JSON format. If you specify version 2 (v2) instead of version 1 (v1), we get version 2 student objects as expected. 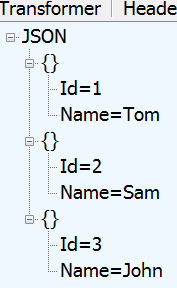 However, if we specify that we want xml format instead of json in the request as shown below. We still get JSON formatted result instead of XML formatted result. This is because we have not added our custome media types to the respective media type formatters (JsonFormatter and XmlFormatter). What is the difference between Aps web services,web API, and wcf? when use one over the other? Please explain in a video.